!! OMG, Buy Them a Gift: Bristol and Levi’s Wal-Mart Wedding Registry !! 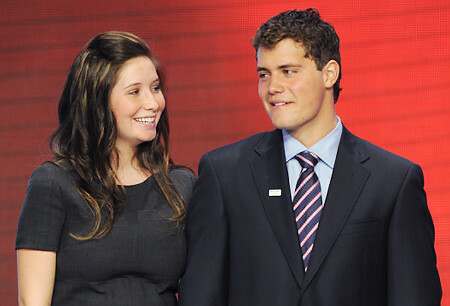 Happy couple and proud mommy and daddy Bristol Palin and Levi Johnston can’t wait to tie the old knot– and they also can’t wait for the presents from joyful Republicans to start rolling in! Among the items the trashy lovebirds are hoping for are several guns, a snowblower, a hunting knife, and some hockey jerseys. Because nothing says I DO like a SOG Seal Pup Elite Fixed Blade Knife. 1 Comment on "OMG, Buy Them a Gift: Bristol and Levi’s Wal-Mart Wedding Registry"